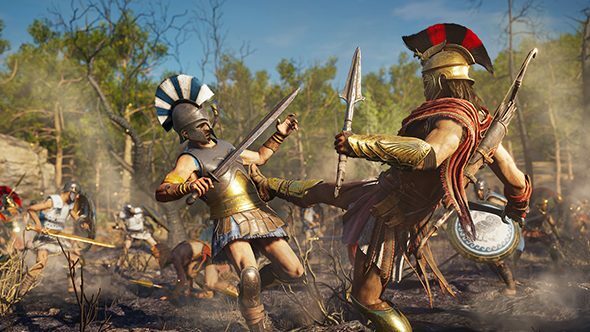 Assassin’s Creed Odyssey will not focus on the actions of the Assassins and the Templars. In an AMA on Reddit, the game’s creative director, Jordan Dumont, revealed that while Odyssey is “absolutely” an Assassin’s Creed game, the Assassins themselves will appear differently to how fans of the series may be used to seeing them. Assassin’s Creed Origins, the series’ last outing, was – as the name suggests – an origins story for the Assassins, which were set up by its main character, Bayek. In his story, Bayek didn’t battle the Templars themselves. Instead, he fought against The Order of the Ancients, a collection of proto-Templars who would shape the way in which the organisation would operate over the coming centuries. But while Origins is set in the middle of the first century BC, Assassin’s Creed Odyssey takes place during the Peloponnesian War between Athens and Sparta. That war happened between 431-404 BC, nearly 400 years before the events of Origins, meaning neither the Assassins nor the Templars had officially been formed. The Assassin’s Creed Odyssey release date is October 5, 2018, so you won’t have to wait too long before you can head to Ancient Greece and wield the Pieces of Eden for yourself. You can check out more than 30 minutes of gameplay footage in the video above.